The art of design is like the art of life, both fueled by inspiration and consciousness. Applying a love mantra to one's design, results in the manifestation of revolutionary ideas. Kahlil Gibran eloquently articulated my favorite quote, "Work is love made visible," which sums up the notion that when we follow our hearts, our work becomes an expression of love. In today's interconnected world, and in the spirit of Jonathan Swift's "Vision is the art of seeing things invisible," design must be approached from a holistic vantage, appreciating its myriad of influences and its ability to affect positive change in the world. The foundation of creative vision is infused with a collaborative force, fueled by love, and ultimately translated into co-creation. Like the evolution of art, and the embodiment of love energy -- crossing all boundaries, nations, languages, ages, races and religions, so too does our planet and global community exemplify the brilliance of design on every level. From the Fibonacci sequence ubiquitous in nature, to the perfect symmetry and symbiosis of all living creatures in our universal ecosystem, to the rebirth of organic methodologies as the heart of agriculture, we can take note of our environment's vibrational influence. As humanity is again re-learning to live in harmony with our natural environment and each other, the dawn of an ECOrenaissance is being born. This lifestyle movement represents the intersection of reinvention, a reconnection to our true nature, and social innovation -- a shift in old paradigms, with every thought, idea and action having a reason for being. Like life itself. In my world of fashion, sustainable design is the DNA. Fibers, fabrics, dyes and finishes are carefully and mindfully selected, incorporating the principles of people, planet, prosperity, passion and purpose. Just as universal love serves as the soul of our physical and spiritual beings--the common thread of our existence -- understanding how to minimize negative human and environmental impacts to create balance and unity, while reflecting on how to protect and build, or renew and restore, is the fundamental tapestry of ECOfashion. Thinking systemically, a successful harvest begins with the healthy cultivation of seeds. 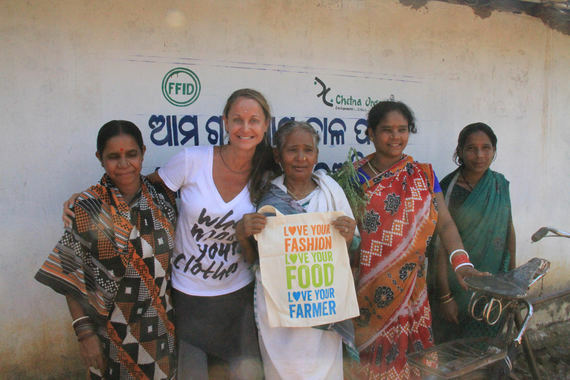 And with authenticity, transparency and intention at the root of ethical design, a more awakened fashion movement can transform an industry that has historically neglected to look beyond the curtain. It's time we find the love and beauty at our collective source to adDRESS change and design a new reality. Somewhere along the path to fast fashion -- and faster, busier lives -- we've lost our way. Per Lao Tzu, "The journey of 1,000 miles begins with one step," and it is up to us now to drive love, life and fashion forward in the right direction. It's a new day, where we can be conscious without compromise; we can look good, feel good, and do good in the world -- embracing the ultimate fashion statement: "love is the new black."